No More Consulting For Me – I’ve Joined A High-Growth Startup! 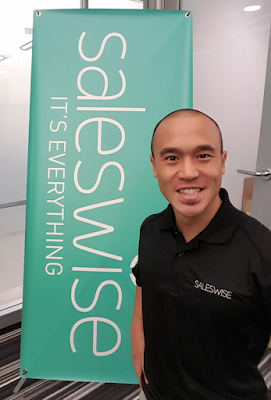 This year has started off with a BANG, so I’m continuing this trend by announcing that I’ve excitedly accepted a position at Atlanta-based startup SalesWise! Many thoughts running through my head… speaking of which, I’m officially the Head of Sales and Marketing… for a truly amazing company. For the last several years since Body Boss, I’ve consulted for several businesses (startups to $1B+ companies) doing business development, web and app development, product management, supply chain, and more. I didn’t have a clear idea of what my Next Great Move was going to be, but used consulting to network, learn, practice, and be inspired. In October last year, with one of my consulting clients, I got to view a demo of new technology from an accomplished CEO and his cofounding CTO. I experienced an impressive product that, with fine-tuning, had great potential. 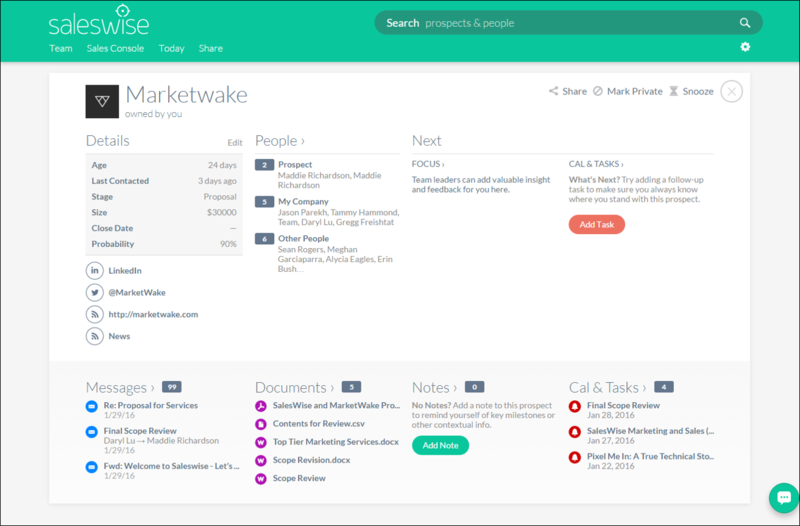 That demo was of SalesWise. The company was early-stage, and I remember thinking this could be my next step. However, I had several consulting projects going, and couldn’t leave yet. Fast forward to November, I ended many of my projects to focus on either building a company or building my personal brand. Well, I chose the latter by writing my book Postmortem of a Failed Startup: Lessons for Success (published Jan 2016!). Meanwhile, come the new year, I wanted to dig my heels into a product-oriented early stage startup. Then, one fateful day in December, I happened to see the CEO of SalesWise, Gregg Freishtat, at a coffee shop – figures I would meet him at a coffee shop. Don’t think he remembered me from October. However, we chatted for a split second, and made plans to meet. We sat down a week or so later, and I learned the company was entirely engineers and himself. He had no other business-oriented employees. They’ve been focused on building the product and were at a point to go big – this got me excited. This was my opportunity to start from the bottom to help a startup grow while working with a highly successful entrepreneur and brilliant CTO in Jason Parekh. I remember Gregg telling me he was looking for three roles – someone in marketing operations, an inside sales rep, and someone who knew conversion analytics. I haven’t had explicit professional experience in marketing operations or inside sales, but I have done them in my own startups in the past. I didn’t have the depth, but I knew that I could do anything given my ability to learn, adapt, and execute. I admitted to Gregg that I didn’t have deep expertise in any one area, but I also wouldn’t “pigeon hole” myself to any one of the three, either. In my view, I would best serve the company at this stage and beyond by being great at all three – “start in sales to understand the voice of the customers – their needs, wants, objections, and value points. Then, I could approach at the macro-level with the marketing operations. From there, I would analyze results and drive conversion… the functions would flow”. I started contracting with the company for January helping get all several marketing initiatives off the ground as part of the launch of the new platform, SalesWise 2.0. A couple weeks ago, I was offered a full-time position to which I VERY happily accepted. This might sound like a product pitch because it is. But it’s a pitch to help illustrate why I’m excited. 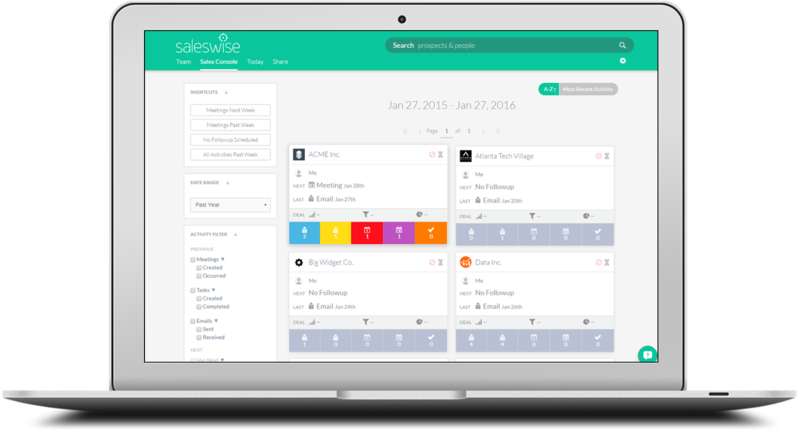 SalesWise is a Sales Intelligence Platform providing comprehensive deal and relationship visibility and data sharing to sales teams to close more deals. SalesWise integrates a sales team’s most critical tools including email, calendar, tasks, documents, and CRM to automatically bring context and deal data together with no manual data entry. The platform enables sales leaders the full end-to-end view of every deal, every relationship, and every prospect to lead their professionals without constant catch ups and long sales meetings. Freedom to sell. Freedom to win. 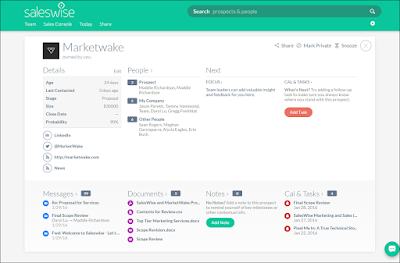 This is the Sales Console – all your prospects in a single view that’s organized and easily filterable for meetings coming up, prospects with no follow-ups, etc. This is the Prospect Card – it pulls your CRM data, email, contacts, documents, calendar… everything about a relationship. Best of all, I didn’t enter anything! It’s all automatically pulled in! You can also share this living, breathing card with anyone so they see what you see (read: collaborate!). After years consulting with other companies, I want to dig my heels into a product at an early-stage company. After all, I want build another product company in the future. The founder is an accomplished entrepreneur having started four prior companies and having successful exits. I’ve learned so much from him already over the last month, and can’t wait to continue developing under him. The engineering team is full of studs. Jason leads the charge as the CTO (hails from Georgia Tech) and every dev he’s recruited has great experience (ex-Google, instrumentation specialties, etc.). The technology, as I said before, has massive potential for sales leaders and sales professionals. When I first entered the product, I got that “wow” factor. Having released a more focused product, responses have been extremely positive. The company needs someone to lead marketing and sales. Count. Me. In. I want to be a builder of the company, and this will be a great place for me to flex my muscles and challenge myself as a leader. Though the CEO has been very successful, he’s open to iterating and learning. I’ve met so many entrepreneurs over the years who use their prior successes as hard-set templates into new ventures even though businesses are completely different. Gregg understands the need to launch, learn, and iterate. He’s building for the long-term gains. I realized over the years that I really enjoyed working alone partly because I stopped trusting others. I don’t want to feel like that. I want to be on a team where I can trust others, and others can trust me. Gregg’s style of leading is conducive to my style of learning and executing. He reminds me of my previous Superboss, Irv Grossman. Both are very passionate (“intense”), intelligent, and great mentors. Gregg expects $hit to get done and thrusts a lot of trust upon me. I get a lot of responsibility, but he’s not shy to roll up his sleeves and do tactical work, too. It’s just a really great opportunity for me. The company is at a point primed for growth with a more focused product after having thousands of users on v1.0. The technology behind the product is exemplary with massive potential. The leadership team are complementary and the team as a whole are hardworking, bright talents. Heck, I’ve already met the Board, and they’re bought into the vision. The last several years of building my brand, my network, honing my skills has led me here – my new chapter. My initial reason for consulting to find my Next Great Move actually worked. However, it was when I made a conscious decision (after several years of consulting) that I wanted to join a startup that I met Gregg. Just a couple weeks later, I jumped on board. Time to do great things! http://www.daryllu.com/wp-content/uploads/2018/10/entrepreneurial-ninja_logo_sm.png 0 0 Daryl Lu http://www.daryllu.com/wp-content/uploads/2018/10/entrepreneurial-ninja_logo_sm.png Daryl Lu2016-02-04 15:48:002016-02-04 15:48:00No More Consulting For Me – I’ve Joined A High-Growth Startup!